The economic invisibility of global public goods —oceans, air, land, forests— has led to ecosystem degradation, biodiversity loss, and negative impacts on human livelihoods and well-being. The Sustainable Development Goals (SDGs) are a clear recognition that the protection of the global commons is essential for achieving development ambitions. TEEB’s core area of work feeds directly into target 15.9 but ultimately making positive contributions to the entire set of SDGs. TEEB considers two key challenges for the SDG implementation by using a « three tiered » structure for the 17 SDGs against the «flat» structure of the usual presentation of the SDGs. Development is still being conceptualized in silos, treating nature as something separate that should be protected and conserved. The 2030 Agenda for Sustainable Development has brought a more holistic way of looking at development issues that assigns equal importance to environmental, social and economic concerns. TEEB goes beyond this and highlights how natural capital stocks and ecosystem service flows underpin all human activities toward achieving the SDGs. 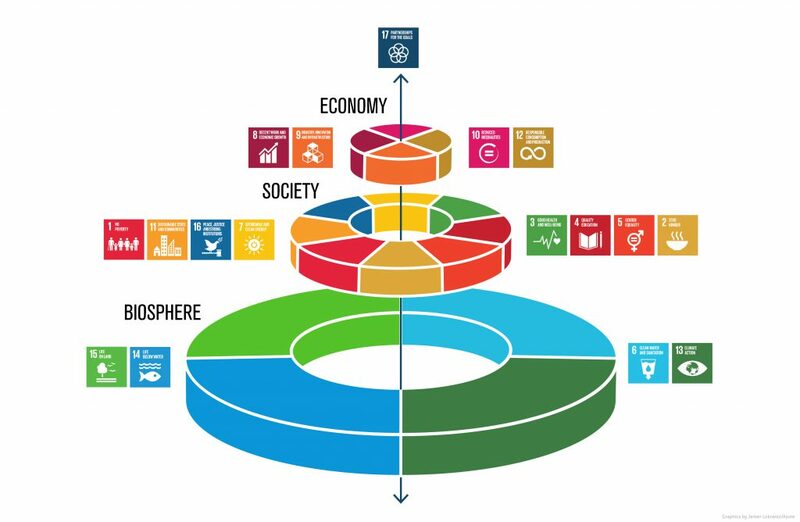 With this approach, the SDGs may be visualized in three tiers as shown in the figure below. UN member states agreed that the SDGs are indivisible and should be implemented in an integrated manner. The goals have been framed with a particular consideration for the interconnectedness of people, planet, prosperity, and peace. TEEB embodies this integrated perspective. While recognizing the need to conserve nature for its own sake, TEEB emphasizes the linkages between human well-being, ecosystem services, and biodiversity. » SDG progress monitoring by populating values for SDG indicators that are grounded in ecosystem science. Ecuador enshrined the rights of nature into its Constitution, creating a rule of law framed around the concepts of “harmony with nature” and of “Good Living – Buen Vivir”, thereby recognizing that conservation of its natural wealth is a prerequisite to achieve other societal goals. The “harmony with nature” concept is included in SDG target 12.8: “By 2030, ensure that people everywhere have the relevant information and awareness for sustainable development and lifestyles in harmony with nature.” Central to this thinking is the aim to create a society where people conserve nature for its own sake, while emphasizing equal access to natural wealth and services, particularly for vulnerable sections of the population. Over the past decade, Ecuador has made significant progress in setting the country on the path to attaining the Sustainable Development Goals (SDGs) by reducing extreme poverty and inequality and increasing energy access. A TEEB Ecuador study supports the country in propagating a virtuous circle of ecosystem conservation and sustainable livelihood creation by adopting a pro-active strategy of investing in natural wealth of the country. Global estimates show that biodiversity investments in productive landscapes can reach up to 79% return on societal goals (TEEB, 2009). » Information brochure “Making nature visible for achieving the SDGs”: brochure explaining that TEEB is to be not only associated with, but pivotal to, the SDGs narrative by applying the three-tiered approach to the SDGs. 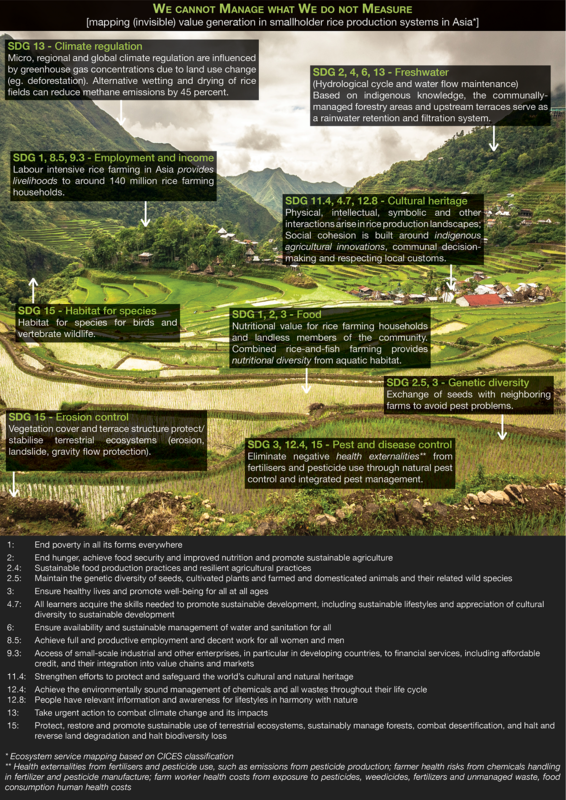 » TEEB for Agriculture & Food—SDG issues report: paper that showcases how the delivery of the SDGs can be scaled-up through a comprehensive valuation framework for Agriculture & Food.